It started last week. At the hospital. They thought I was the grandma, not the aunt. This, less than a week after someone told me I didn’t look old enough to have a freshman in college. AND I am NOT. Well, okay I am, but still…..I went from too young to Grandma faster than my children hide when they know it’s time to clean up. I was reminded once again that there is a season for everything. I guess this is the season for my babies to grow up. All I can say is I got that puppy just in time y’all. All of these changes are going to put me in dire need of some cuddle puppy time, I’m thinking. 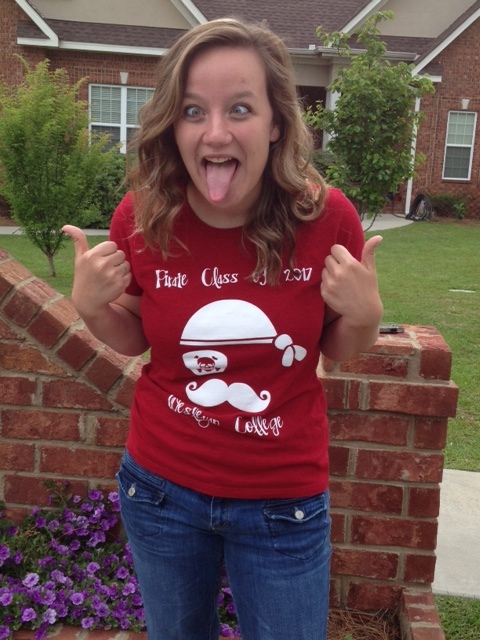 This one here, in college, newly elected STUNT chair, and goofy as the day is long. Making me feel old! Last night, this one reminded me of how her growing up years have paralleled those of Harry, Hermione, and Ron. (*sniff* I do love them so.) She also, on her journey to make her experience at my alma mater her own, decided that it wouldn’t be so bad to try something her Mama enjoyed. She was selected to be on her class’ STUNT Committee, and they elected her the chairperson. I am verklempt I am telling you. Overwrought and tickled pink. But it is NOT POSSIBLE AT ALL that what feels like yesterday and my own STUNT journey was actually twenty-seven years ago. That’s right, I said 27! Oh my. 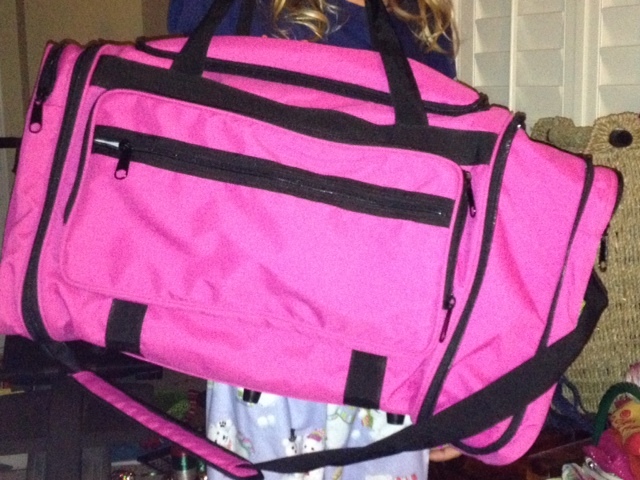 This is our Princess’ overnight bag. It stays packed. And ready to go. And she has been asking me, imploring me, flat out begging me each and every day–several times–to call Mess Cat and Leroy to see if she can spend the night with them. I mean, good gravy, she was just there Thursday night. I’m thinking transition to college and dorm life will be easy with this one. She’s not even nine, and she’s practically ready to move out now. Can you see the size of that bag? But this, this is what is really making me feel old and what I’m simply not prepared for. At all. 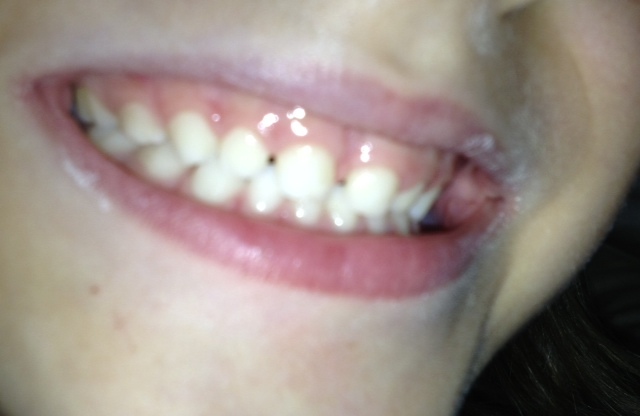 That bottom middle right tooth as you’re facing it–that little booger is LOOSE. He is so ready for this. Our neighbor friend’s oldest, who was three months younger than Cooter, had already lost several teeth before they moved. I was thinking we could go on for a while like this. I’ve heard it’s not unusual for some children to reach 7 before losing a tooth. I was okay with that. So when today, he calls me over and says, “Look Mama, my tooth is wiggly,” I just about fell out and dropped MY teeth. No. Friends, this is my BABY. He cannot start down this next path of growing up. I. Am. Not. Ready. Did I mention this is my baby? Are you serious? Do I even know you? And to think I once worried that he might never speak. Ahem. Silence is golden, people. And then they were off on a discussion of age and what constituted old and that’s when I stopped listening again. It’s just too much some nights, you know? Some days I feel older than others and today, still flying on the exuberance of seeing my friends last night, was not one of those OLD days. Until I saw that tooth and counted back the years to when I was a freshman in college and explained yet one more time why our Princess cannot move out to live at her aunt’s house just yet. It all just goes by too fast. I think I’m gonna go cuddle a puppy now. While I can. Because it seems that we have just entered the season of growing up too fast. And I’m not even grown up all the way yet. No matter what that nurse and my little guy think. ***STUNT is a competition between the four classes at Wesleyan College, in which each class writes, directs, choreographs, and performs their own thirty minute comedy musical. The committees writing it keep it a secret until two weeks before STUNT night when they reveal it to their class. Each class then learns lines, songs, and dances and prepares their backdrop in a two week period. Money raised from the performance go to scholarships for students. Coolest thing ever.